Use the MP 5055 Black and White Laser Multifunction Printer (MFP) effortlessly to print, copy, scan and fax (optional) via automated workflows, customizable controls, mobile operation and more. Work quickly and add professional polish with multiple finishing options, including folding and stapleless sets. Give your mid-size business what it needs to get the job done. 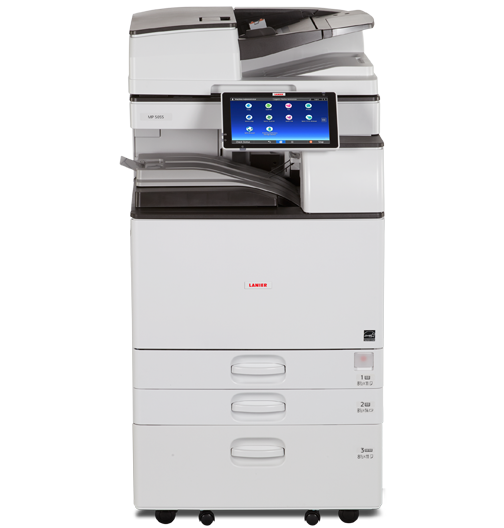 Print and copy black-and-white output at up to 50 pages per minute (ppm). Place originals up to 11" x 17" into the easy-to-use 220-Sheet Single Pass Document Feeder (SPDF) to create digital scans and share them instantly with a wide selection of Scan-to capabilities or optional paperless faxing. Tailor the MP 6503 to work the way you do. For example, use your smartphone or tablet and print or scan by connecting directly to the 10.1" Wide Super VGA Smart Operation Panel touchscreen. An embedded web browser also makes it easy to access the internet and take advantage of powerful scanning and cloud services, including Ricoh DocumentMall and Syncplicity Enterprise File Sync & Share. Download the Smart Device Connector app to your smartphone or tablet to work while on the go. Use the optional Integrated Cloud Environment (ICE) to access information from cloud applications, such as Dropbox™ or Google Drive™. Print it or save it to your mobile device, or, print via AirPrint®. Scan originals directly to your personal device and carry the files with you. Simply begin by connecting and authenticating via the Near Field Communication (NFC) tag. Create professional work in house with crisp 1200 x 1200 dpi resolution and multiple finishing options. Use the internal, space-saving Multi-Fold Unit to add different types of automated folds. Choose from various other finishers for hole-punching, booklet making and stapling. You can even minimize supply costs and simplify paper shredding with automated stapleless finishing for document sets of five or fewer sheets. Use the touchscreen to access information, check settings and perform tasks effortlessly on the all-digital 10.1" Smart Operation Panel. With multiple user interfaces, you can find what you're looking for instantly via our Workstyle Innovation Technology. An embedded web browser lets users locate information online and print it at the device.